For the first time in the United States, robots are working alongside human employees in small offices and factories, changing the way factories think about and use robots on a daily basis. Meet Baxter, a small collaborative robot currently helping small factories with their workload across the United States—and yes, it makes faces. Baxter is equipped with a computer screen face that displays a pair of eyes that are able to express different emotions. In fact, if a human co-worker sneaks up behind or randomly moves in front of Baxter, the robot registers that something has invaded its “personal space” and is able to look surprised. This interactive ability is what makes Baxter a collaborative robot. It is able to acknowledge other employees, adapt to their needs, and safely work alongside them in a small environment. This is huge change from the robots to which factories in the United States have become accustomed. Robots have been working in factories for years, but they are usually much larger, more dangerous, and typically only serve one purpose. 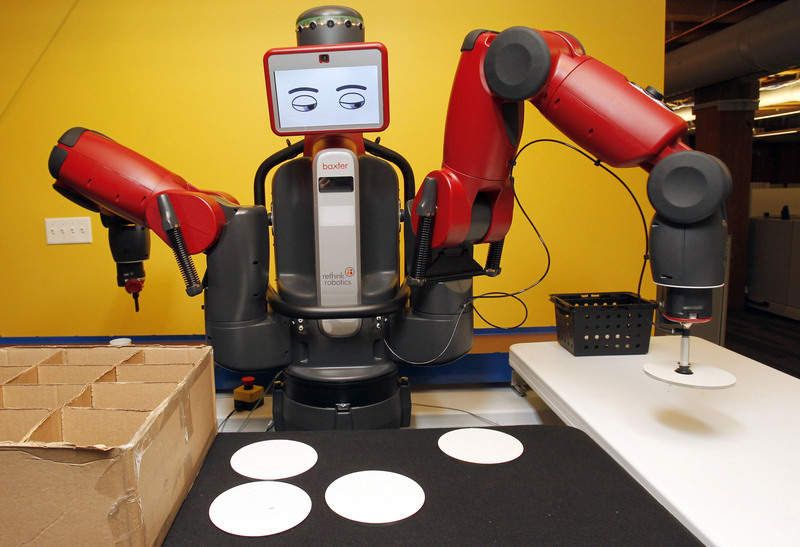 Small collaborative robots, like Baxter, are redefining the term. According to the Wall Street Journal, collaborative robots are working their way into factories across the United States, primarily due to their ability to decrease production time and reduce labor costs. They make it possible for human workers to move on to more important jobs in their company. In fact, some workers are now managing the robots that are performing the same tasks they used to do. Panek Precision Incorporated, a precision machine shop in Northbrook, IL already has 21 robots like Baxter. The company has experienced such great success with them that it plans to add up to 14 more by the end of next year. Standby Screw also recently added a Baxter to its team because it is safe, efficient and can be manually trained to do multiple jobs in a given period. Collaborative robots don’t just benefit the companies that use them; the companies that manufacture their component parts are also enjoying an increase in business. Precision machining companies like Lampin Corporation in Uxbridge, MA who are manufacturing – with the requisite tight tolerances – the gearboxes, shafts and pulleys required by these new robots, should reap huge benefits as the sector grows. Between the businesses that are using the robots and the ones that are making the parts, these small robots are impacting the American economy in a big way. Currently, the only thing holding these robots back is the fear of change, which is sure to hinder more skeptical companies in the long run.